IT Support For a Non-profit Trust | Pebble Infotech Pvt. Ltd. Client: Jayanti Memorial Trust is a non-profit foundation dedicated to providing cardiac treatment to underprivileged Nepalese citizens. The foundation carries the legacy of late. Jayanti Shah and her dream to take cardiac care at the door step of heart patients grasped by economical constraints. Recently, they expanded their visibility by establishing an online presence. Challenge: Couple of weeks back, we inspected our client’s site which was running at a turtle pace. The load-time of the page was more than 10 seconds which resulted in navigational issues, and site abandonment rate was mounting to a sky high level. Before things got worse, our team looked into the anatomy of the site and tried to crawl into the core of the problem. Firstly, they preferred the reboot option. In most of the cases, this option sorts out the speed issues but not this time. There was something bigger that was preventing the page to run at its normal speed. Solution: The site was built with WordPress. When we entered the Webmin Panel’s Dashboard the CPU usage was more than 30%, RAM usage was 50% and the numbers of system processes running was more than 260. The stats were nasty!!!! This certainly was a head rattling issue, we had to figure out what was consuming so much memory and slowing down the server. 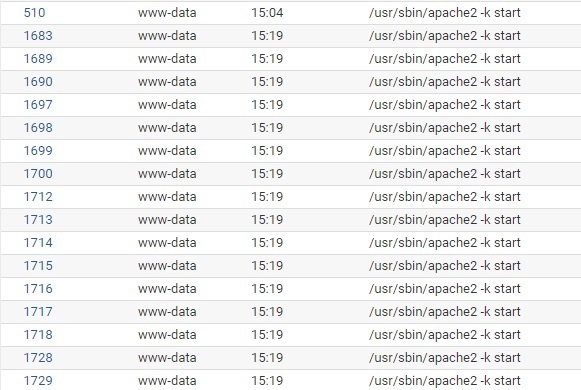 We navigated our way to running processes tab, the dashboard was bombarded with too many apache instances called “/usr/sbin/apache2 -k start”, ran by www-data. So we performed a trace process to locate the core of the problem. Our analysis showed us that there was a plugin named “iThemes Security Pro” which was constantly firing up the apache process. Then we navigated to the WordPress dashboard and deactivated the “iThemes Security Pro” plugin and restarted the apache process with a hope that things would get better. Still, the results were the same. The site speed was dwindling and the backend was still operating at a lumbering rate. Then we came up with a better solution, we deleted the iThemes Security Pro plugin and rebooted the system again. Things finally started to get better. The apache instances were reduced to 11, server RAM usage significantly lowered down to 7% and the site jump-started once again. iThemes Security Pro is a heavy plugin, this tool pushes continuous request to the server to create many apache instances, which conclusively demands more memory and reduces your server speed. Our client’s site started to function at normal speed. CPU load was reduced and RAM usage was drastically decreased to 7%. The page load time was reduced to 2 seconds.